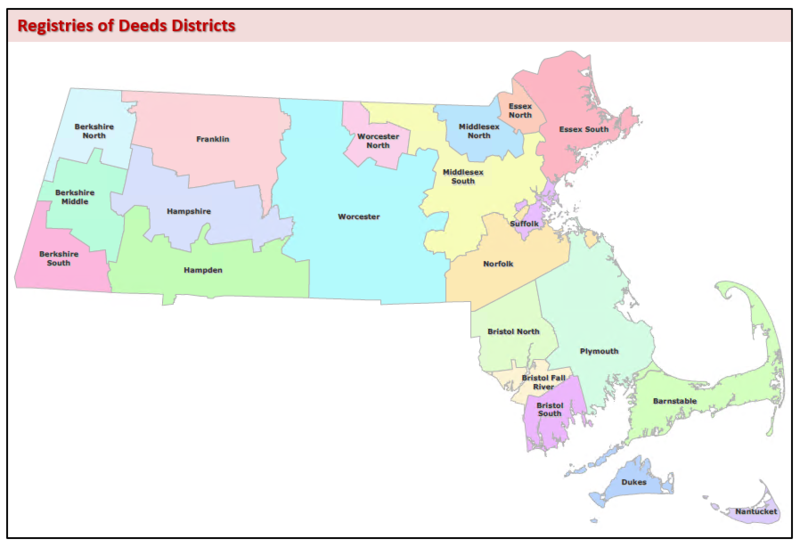 This polygon layer depicts the boundaries of the 21 Massachusetts Registries of Deeds districts. The Registries receive and record hundreds of thousands of documents each year, and are basic resources for title examiners, mortgage lenders, municipalities, homeowners, and others with a need for secure, accurate, and accessible historical and modern land record information. Documents stored at the Registries include titles, deeds, mortgages, releases, and liens, etc. The layer is stored in ArcSDE and distributed as REGDEEDS_POLY. This layer was created by MassGIS from the Towns layer. Each town was assigned a REGDIST code, which corresponds to the Registry of Deeds to which the town belongs. Then towns boundaries with the same Registry were dissolved to create the 21 districts. All unnecessary fields were deleted and several fields subjective to the Registries were added. 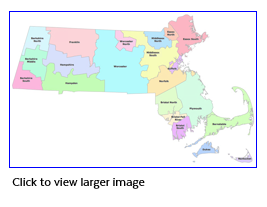 In January 2019, the district boundaries were modified to move the Town of Orange from Worcester to Franklin. MassGIS maintains this datalayer. Updates will be made after election results are complete and members are sworn in.